Let’s Octoberfest like it's 1999. ONE Pumpkin Pie is a taste of autumn that you totally...ahem...fall for all season long. 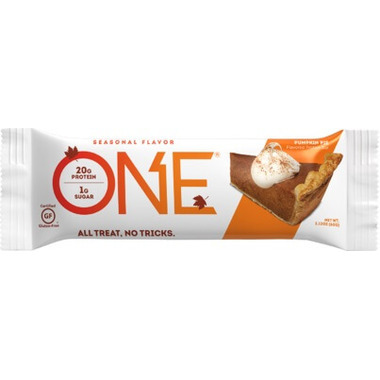 And with 20 grams of protein and just 1 gram of sugar, you’ll still fit into any svelte Halloween costume - or any other outfit - you choose. So don’t just wait for the Thanksgiving table. 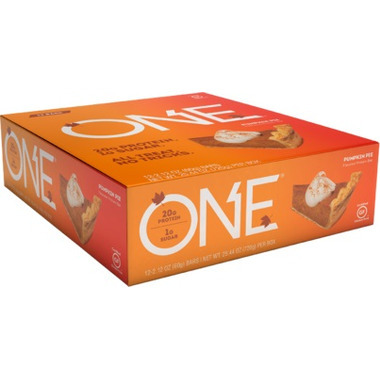 Bring some Pumpkin Pie to work, the gym or anywhere you gather - and give thanks for guilt free snacking. Ingredients: Protein Blend [(OhYeah!® Blend Consisting of Whey Protein Isolate, Milk Protein Isolate), Isomalto-oligosaccharides (Prebiotic fiber from Vegetable Source), Malitol, Glycerine, Palm Kernel Oil, Sunflower Seed Butter, Natural Flavors, Non-Fat Dry Milk, Soy Lecithin (an Emulsifier), Alkalized Cocoa Powder, Sea Salt, Tapioca Starch, Calcium Carbonate, Distilled Monoglycerides, Color Blend (Beta Carotene, Fruit Juice, Paprika Extract, Citric Acid, Asorbic Acid) and Sucralose.